If there’s one universal truth about the mobile app market, it’s that a small amount—less than 5%—of users make an in-app purchase (IAP) in a freemium app or game. Mobile marketing automation provider Swrve confirmed it. App analytics company App Annie confirmed it. Mobile attribution firm AppsFlyer confirmed it. And many more. The low conversion rate of non-paying to paying users for many freemium businesses is through no fault of their own. “Low conversion in freemium is a feature, not a bug,” as mobile media strategist Eric Seufert puts it. So how are app companies today adapting to the financial realities of the freemium business model? In most cases, they’re complementing IAP revenue with a mobile advertising revenue stream. In fact, 78% of the top 50 grossing mobile games in the U.S. feature ads (top grossing listed by IAP and in-app subscription revenue), according to 2017 Apptopia data provided to The Wall Street Journal—up from 45% in 2016 and 29% in 2015. And rewarded video is the most utilized mobile ad format among freemium game companies. But many of the leading freemium apps outside of games have yet to give rewarded video, let alone in-app ads, a fair chance. Among the top 50 grossing apps in the U.S., only 12% of non-gaming apps monetize through in-app ads, according to App Annie. With all of this mind, we’ve put together a handful of lessons on rewarded video monetization—sourced from the best mobile game devs using the lucrative ad format—for non-game app companies to put into practice. Have you ever felt too ashamed to invite people over to your home, fearing what they would see inside—or even outside? You’re not alone. According to research from moldable glue maker Sugru, 61% of U.S. adults don’t allow guests into their homes for this very reason. Many non-game app companies have this same fear about in-app ads. They treat their non-game apps like a messy home, with in-app ads playing the role of the household item that should be tucked away from plain sight when guests come over. With in-app ads, especially rewarded video, you actually want to do the opposite. 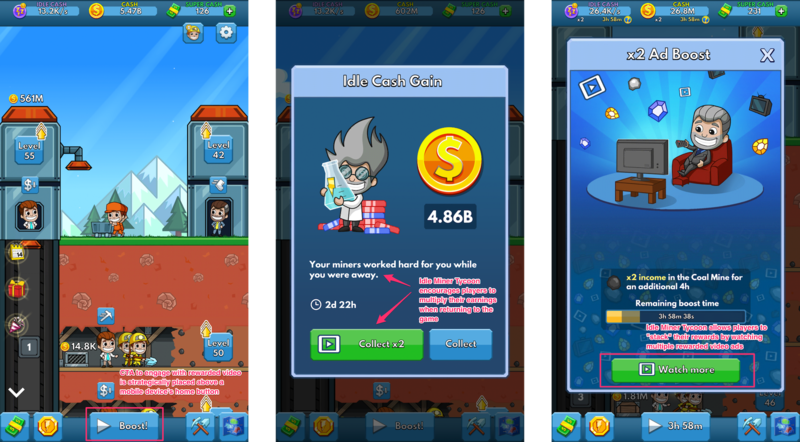 Kolibri Games, formerly Fluffy Fairy Games, places rewarded video ads front and center in their hit idle game Idle Miner Tycoon. Players can engage with a rewarded video ad almost anywhere in Idle Miner Tycoon, thanks to an ad placement that’s located in the bottom middle of the game’s user interface. Besides being physically more visible, rewarded video ads should also be a natural part of your non-game app’s user experience. 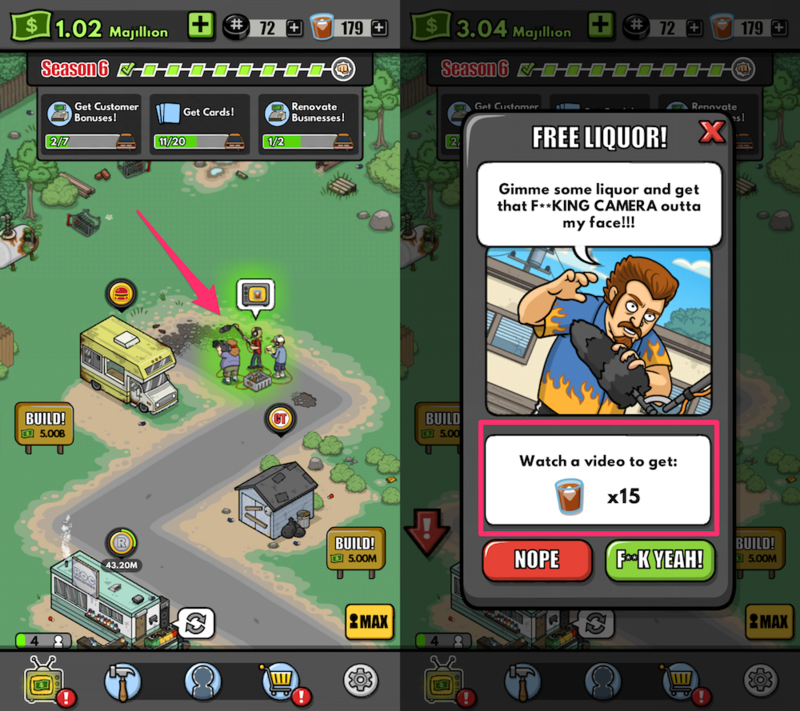 In Trailer Park Boys: Greasy Money from Vancouver-based East Side Games, for example, a camera crew randomly appears in the game’s trailer park overworld. By engaging with this camera crew feature, players can watch a rewarded video in exchange for virtual currency. The camera crew rewarded video ad placement naturally fits the world of Trailer Park Boys, leaning on the TV show’s mockumentary style of filming. Melissa Stein, global vice president of ad product at Candy Crush maker King, said it best in a May 2018 webinar with the Mobile Marketing Association, “If you create a great advertising experience for players, they’re going to want to engage with it.” That’s the beauty of the rewarded video ad experience. For 15-30 seconds of their time, users are given a reward in return, such as virtual currency. Outminds took the feeling of wanting to watch ads to heart with their rewarded video integrations in their game PewDiePie’s Tuber Simulator. During the development of Tuber Simulator, Outerminds consciously thought about how to integrate rewarded video ads that players want to watch, rather than rewarded video ads that Outerminds want players to watch. It’s a subtle distinction, but a critical one to remember for your rewarded video integration. Rewarded video is your opportunity to give customers a taste of the premium offerings in your non-game apps. I previously wrote that some of the most successful mobile games also happen to be some of the most generous in relation to giving away content for free. Finnish developer Next Games is a prime example of a generous mobile game developer that non-game app companies should pay attention to.